HD Tach is a low level hardware benchmark for random access read/write storage devices such as hard drives, removable drives (ZIP/JAZZ), flash devices, and RAID arrays. HD Tach uses custom device drivers and other low level Windows interfaces to bypass as many layers of software as possible and get as close to the physical performance of the device possible. After giving the OCZ RD400A 512GB a clean format and ensuring alignment and everything is correct, I fired it up for some testing in HD Tach. While HD Tach is more of a 'drag race' than a clear indication of real life performance, and has been around for a really long time, it is an excellent storage performance reference among SSDs with the same controller, and has been our favorite benchmark long before hard drives even cracked the 50MB/s mark. 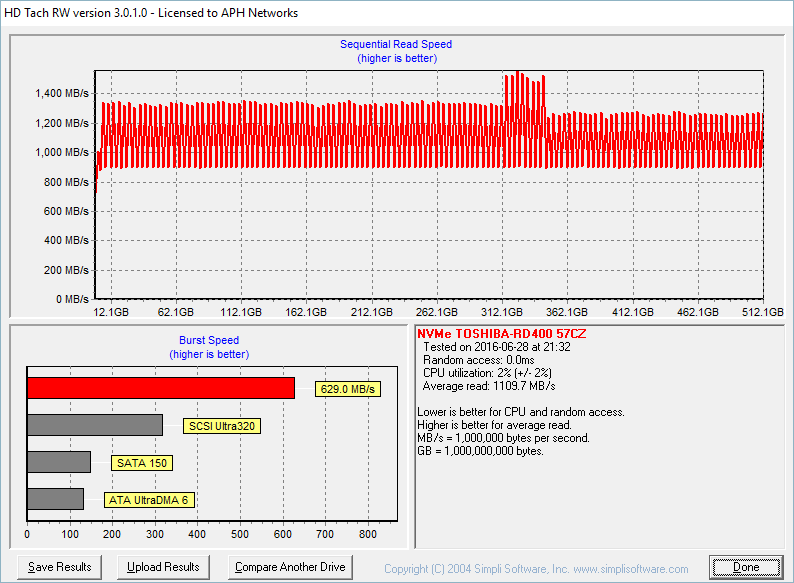 With an average read speed of 1109.7MB/s according to HD Tach in single disk configuration, this is by far the best score we have ever seen here at APH Networks (The SanDisk Ultra II 240GB is the fastest single SATA 6Gb/s disk at 469.3MB/s, while the Kingston HyperX Predator PCIe 480GB came in at 770.4MB/s). For most solid state drives, we typically look for something that is faster than 350MB/s. From our experience, most drives do not crack the 400MB/s line. At the end of the day, HD Tach may not be the best test for solid state drives all the time, but we really cannot argue against the results.